These fiercely noble Snow Bears are said to have been brought from the legendary frozen continent of Atmora by mighty Ysgramor himself, who deemed them the only worthy avatars of the ancient Nord Bear totem. The Atmoran Snow Bear is a mount that is available from the Crown Store via Hollowjack Crown Crates as an Legendary-level reward. Its default name is "Tundra". The Badger Bears of southern Blackwood were nearly extinct in the wild when they were saved by the intervention from an unlikely source, an Imperial noble. Viscount Glorion of Leyawiin rescued the species by breeding them as mounts. 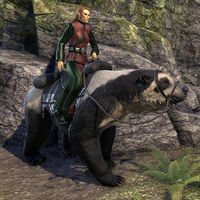 The Badger Bear is a mount that was available in the Crown Store from November 1, 2018 to November 5, 2018. Its default name is "Honey". The Bear-Lizard Steed is available from the Xanmeer Crown Crates as an Apex-level reward.. Its default name is "Roly-Scaly". The Black Bear is common across Cyrodiil, but is also seen north into High Rock and Skyrim, where it is considered a warrior's mount. The Black Bear is a black bear mount, formerly available from the Crown Store from February 18, 2016, until February 22, 2016, for 025002,500 . Its default name is "Nightpaw". Found throughout Tamriel's northern mountains, the Cave Bear makes a hardy and imposing mount. The Cave Bear is a large brown bear mount released alongside the Orsinium DLC. It is available from the Crown Store individually for 018001,800 , or as part of the Orsinium DLC Collector's Edition for 050005,000 . Its default name is "Theodore". Dragonscale bard is just about the heaviest armor one can put on a mount, but bears bred as mounts are so strong they scarcely seem to notice it. The Dragonscale Barded Bear was available from the Crown Store in the Dragonscale Crown Crates as an Apex-level reward. Its default name is "Bear". 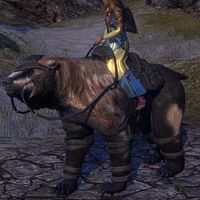 Scholar of the Dwemer Guylaine Marilie theorized that bear vamidiums were animunculi mounts reserved only for those Deep Elves of high rank or status. "Imagine a noble in full armor on a Dwarven Bear Mount," he wrote. "What could be more impressive?" 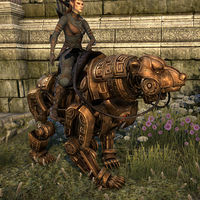 The Dwarven Bear is a Dwarven Automaton-themed mount, or "vamidium". It is available from the Crown Store via Dwarven Crown Crates as an Apex-level reward. Its default name is "Btham Ahrk". When the Empress Hestra led her legions in harrying the Vampire King Styriche and his Gray Host into western Hammerfell, it's said she did so while riding a great Flame Atronach Bear Mount named Fiery Ursula. The Flame Atronach Bear is Flame Atronach-themed bear is available as an Apex-level reward in Flame Atronach crates. Its default name is "Scorchbear". The Bear was also one of the ancient Atmoran animal tokens, associated later with the Nord god Tsun, so the Frostbane Bear has historically been one of the most prestigious mounts a tradition-loving Nord could ride. The Frostbane Bear was available from the Crown Store in the Scalecaller Crown Crates as an Apex-level reward. Its default name is "Tsunny". When the moons rise over the Witches Festival, Jaque o' the Hollow haunts the mounts of mortals, cursing their riders to gallop headless through the night. Even the doughty bear mounts of the Nords are susceptible. The Hollowjack Rider Bear is a mount available from the Crown Store via Hollowjack Crown Crates as Apex-level reward. 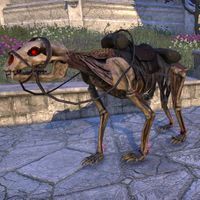 Its default name is "Ursus Headless"
Both swift and strong, the Masked Bear of the Jerall Mountains is a popular mount along the high passes between Bruma and Falkreath. 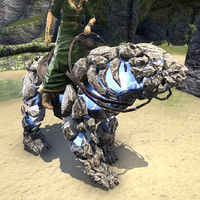 The Masked Bear is a large black and white bear mount available from the Crown Store for 025002,500 , or in Flame Atronach crates as a Legendary-level reward. Its default name is "Bandit". A re-animated Skeletal Bear makes a fearsome mount, and is a favorite of northern Tamriel's necromancers. The Skeletal Bear is available in the Reaper's Harvest Crown Crates as an Apex-level reward. Its default name is "Barebones". The Snow Bear makes a superior mount for northern climes, as it's undaunted by even the fiercest winter weather. 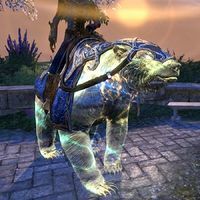 The Snow Bear is a large white bear mount previously available from the Crown Store for 025002,500 . Its default name is "Coldwind". According to Nord legend, in his wars against the Snow Elves the might Ysgramor the Harbinger rode a Storm Atronach Bear Mount conjured for him by his personal Clever Man. 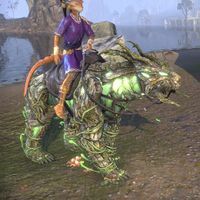 The Storm Atronach Bear is a storm atronach in the shape of a Bear mount, available as an Apex-level reward in the Storm Atronach Crown Crate. A bolt of lightning strikes it when it roars and it glows for a few seconds afterward. Its default name is "Ugly Hugs". The rare Sweetroll Grizzly Bears prowl the golden forests of the Rift on the northern slopes of the Jerall Mountains. They're big strong cuddly hug machines—except when they're angry. 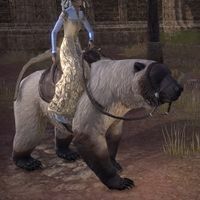 The Sweetroll Grizzly is a bear mount that is available from the Crown Store via Dragonscale Crown Crates as a Legendary-level reward. Its default name is "Pastry Paws". Though the famed bard Svaknir wrote a hilarious song in which the Tuxedo was mocked as "the Chub Loon of Bears," this magnificent ursine mount has been esteemed by Nord nobles since the early First Era. The Tuxedo Bear is a bear mount resembling a larger, thicker-fured sun bear. It was available only as part of the Black Fredas Special! for 019001,900 . Its default name is "Stibbons". The Wild Hunt Bear is available as an Apex-level reward in the Wild Hunt Crown Crate. Its default name is "Branch-Britches". It leaves behind green pawprints, and small flowers briefly bloom where it stands still. This page was last modified on 2 April 2019, at 16:58.